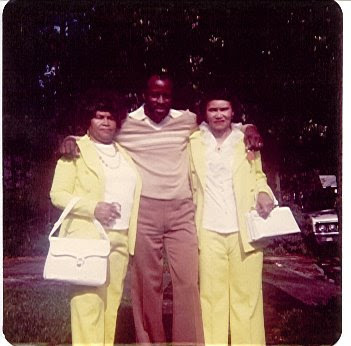 This is a picture of Vincent with his mother Irene, to the left and her sister, Vivian, to the right. The photo was taken in the summer of 1979. Below is an excerpt from an article written about Alzheimer that was published in a local magazine in Savannah, Georgia. The article was written by Verdelle Lambert, whose mother also suffered from Alzheimer. My dad, Vincent and Verdelle were classmates in high school. When Ms. Lambert discovered that my grandmother was also suffering from Alzheimers and my father was her caretaker, she would often call to check on them both and give him words of encouragement. They were reunited by the horrors that they both were experiencing from this disease that affects so many. This excerpt is from Ms. Lambert's interview of my father after his mother's death. In the beginning, Mrs. Hicks couldn’t get her words out clearly, and then she got to the point where she couldn’t talk at all. Finally, she wasn’t able to chew her food. “When she stopped eating, she lost weight and she just went on down,” Vincent said. “It wasn’t easy on me, but I just had to deal with it. I knew that that was part of the disease. I just took one day at a time. If it wasn’t for God giving me the strength to handle the situation and my wife helping me out a lot, I probably wouldn’t have made it. Praying, having a good partner, and having understanding and love between my mother, my wife and myself— that’s what brought me through. My wife had to love me and my mother to let me do what I needed to do, and help me take care of Mom. “I prayed for Mom to get better, and when I saw that that wasn’t happening, I asked God to take care of her in heaven,” Vincent continued. “You know, I guess it was her time. She was 94 years old: she had had a good life and a long life ... and that was it.” Mrs. Hicks died in 2008, and Vincent, who had been with her at Memorial Hospital day and night for about three days, was right by her bedside. The medical staff removed the machines that had been monitoring Mrs. Hicks and asked Vincent if he wanted to stay there until his mother was taken away. “I think that was the hardest part for me,” said Vincent. “Oh, man, that was hard: to see your mother put in a body bag, that was hard. It was hard. It was harder than seeing her put in the grave.” The Rev. Rick Bready and the deacons (and some of the deacons’ wives) at Tremont Temple Baptist Church came to Mrs. Hicks’ house during the 8-10 years of her illness to pray with her, give communion, and sometimes even bring food. “I was really pleased with the way the church kept in touch with my Mom,” said Vincent. For sure, Mrs. Hicks couldn’t be more pleased with the way her son cared for her. Love never fails. I'm trying to contact the Tremont Temple Baptist Church by email. I have relatives that attended this church in the 1950's and 60's. I'm doing some genealogy and family history research in Savannah, where I was born, and left as a child. We have friends here in the Los Angeles area suffering from Alzheimers, as well. If you have the information, I'd be very appreciative. And thanks in advance. I still have family that attend Tremont Temple, so I still have some connection there. If there is anything that I can do to help, please let me know.